I can't deny any longer that the holidays are getting close. Yesterday I went through my stash with my list. Word of advise...don't give someone a hand knitted present unless you are prepared to do so forever. I wish I were better at organizing my time. I plan to use stash yarn as much as possible. I spent some time on my proposals for the summer issue of Cast On. The selection meeting is next week. TKGA has been updating their website and I did not get any new orders during that process. It is up and running now and is quite nice. Take a look. New website There is a photo of me on the home page. I think it is the Argyle class from the Reno Knit and Crochet Show. I hate having my photo taking but I try to be a good sport. I didn't get many lessons to review during the holidays. Things really slow down this time of year as everyone seems to think they will knit Christmas presents. 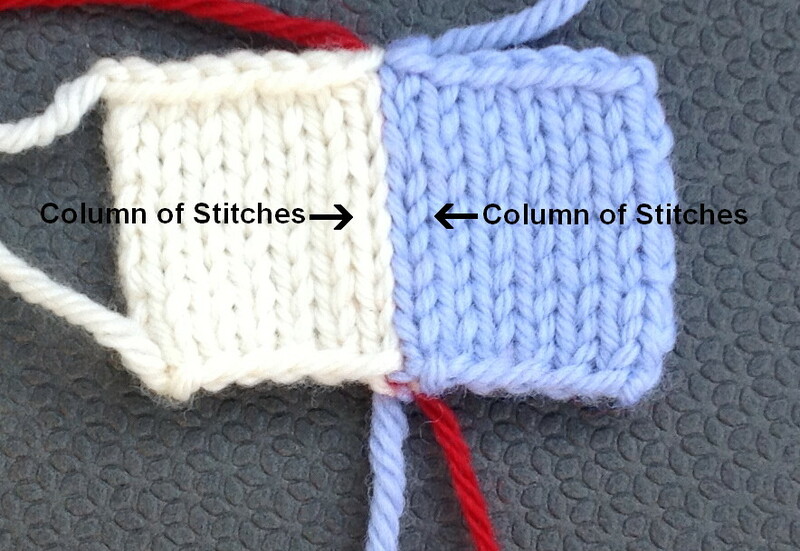 The tip for this week is how to seam stockinette stitch. Since I did how to seam garter stitch a few weeks ago, I thought I should probably add the mattress stitch. Seaming stockinette stitch is the most satisfying of all seams. When done properly, it is completely invisible. What makes a good seam? The rows on either side of the seam must line up. Before you begin, identify where you will place the seam. You will use the horizontal bars between the selvedge edge and the first column of stitches. This is one reason to block the pieces first and to flatten the selvedge stitches. It make it much easier to see where to place the seam. 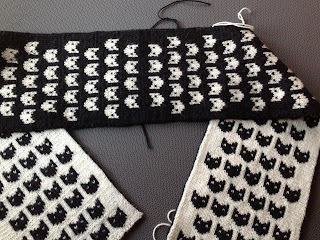 If you are having trouble seeing this, consider marking the first column of stitches with waste yarn so you don't get off. Begin with the "Figure 8" which I discussed in the entry for October 26th. One the Figure 8 is complete you insert your needle into the piece on the left in the same hole between the horizontal bars where the yarn came out. You bring your needle under the horizontal bar and then bring it up into the hole on the other side of the bar. You repeat this process on the right side, always inserting the needle into the same hole where the yarn came out. Some sources tell you that you can go under two horizontal bars on each side. Yes, this does work and it might be quicker but it is much easier to get off so that the rows don't align properly. When I was reviewing submissions for Level 2 of the Masters Program, I noted that this was a very common problem. Going under each horizontal bar may take more time but it will give you a better looking seam. The photo shows the completed seam. Notice that two column of stitches line up exactly. This swatch also demonstrates why tension is important. Many knitters have tension issues at the selvedges. When the pieces are seamed, the stitches on one side differ in size which detracts from the appearance. The stitch in this swatch have nice tension. 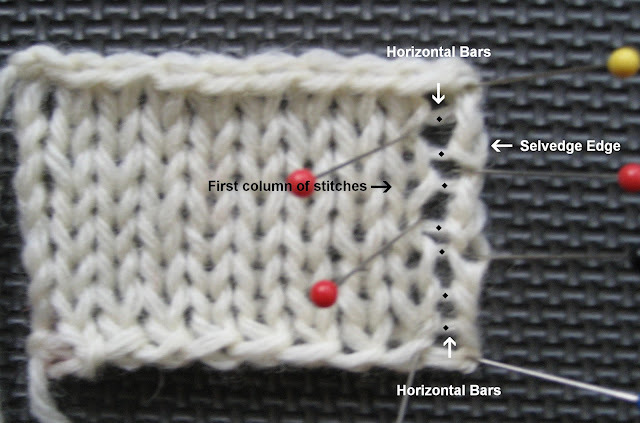 Another way you can seam stockinette is to use the horizontal bars IN the selvedge stitch. 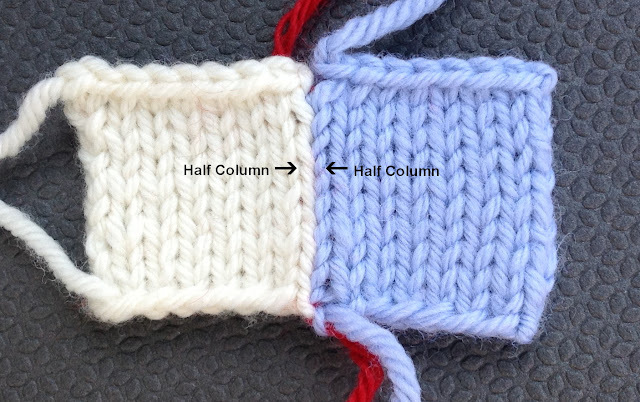 When you do this, half of a stitch is on either side of the seam. There are many problems with this. Since selvedge stitches are often ugly and misshapen, it is better hidden in a seam. The swatch in this photo doesn't demonstrate this as the tension is fairly even. I have seen some really ugly seams in my time. When might you want to do this? If you are working with a very heavy yarn, this will make the seam less bulky. Salon will be on Sunday from 2-5pm. The Met Simulcast of La Clemenza di Tito by Mozart is on Saturday. There is an opera for the next three weeks. Ashland (the Henry Clay Home) which is across the street is having their tree lighting at 5pm. I'll probably walk over after Salon. 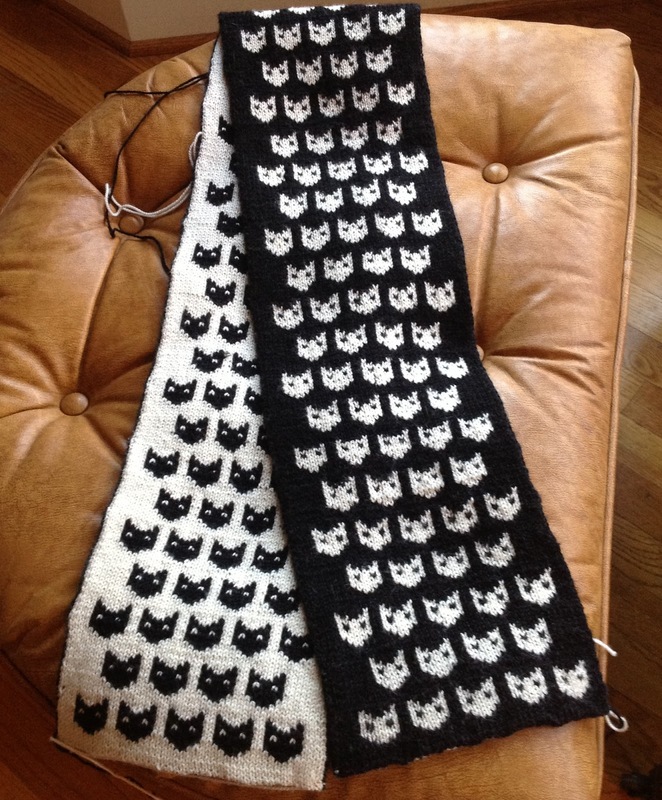 I FINALLY finished the cat scarf. Double knitting is fun but very time consuming. It didn't help that I undid the thing four or five times. I couldn't decide on a width. When I got to the center I reversed out the chart so that the cats are looking at you. Suzanne's instructions in the May-June 2012 issue of Cast On were invaluable. 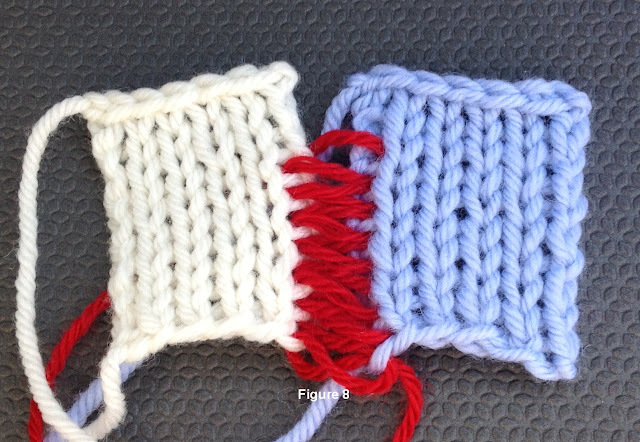 If I ever do double knitting again, I'll use heavier yarn. This was sock yarn and size 2.5 needles. Now that I've finished this project, I am beginning my holiday knitting. Most everyone is getting fingerless mitts. I plan to use the Happy Sparkle Day pattern. The great thing about them is that since they are ribbed, I don't need to make many modifications to the pattern since the ribbing stretches and contracts. 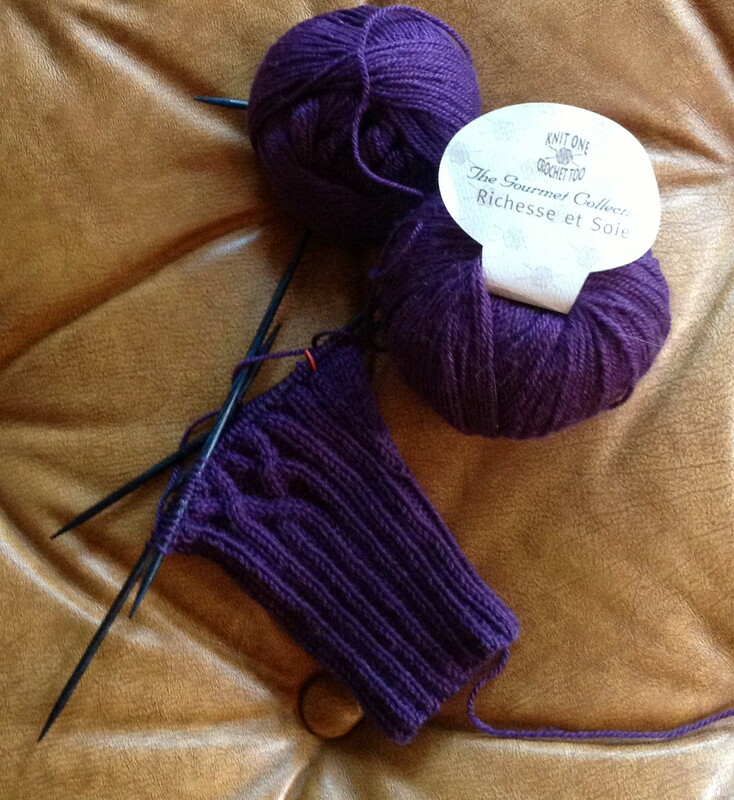 I am using some cashmere-silk yarn I have had around for years for the first pair. I love this yarn. It isn't made anymore. I bought a ton when Patternworks discontinued it. It is the softest yarn and unlike most cashmere-silk blends it doesn't pill.